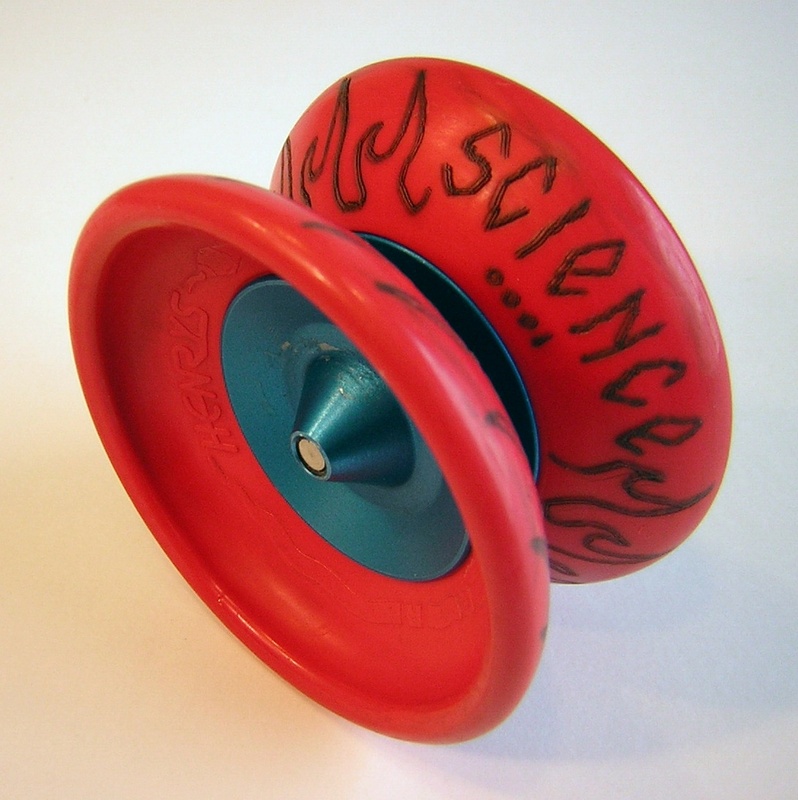 For many years, the modified Viper was my favorite yo-yo. 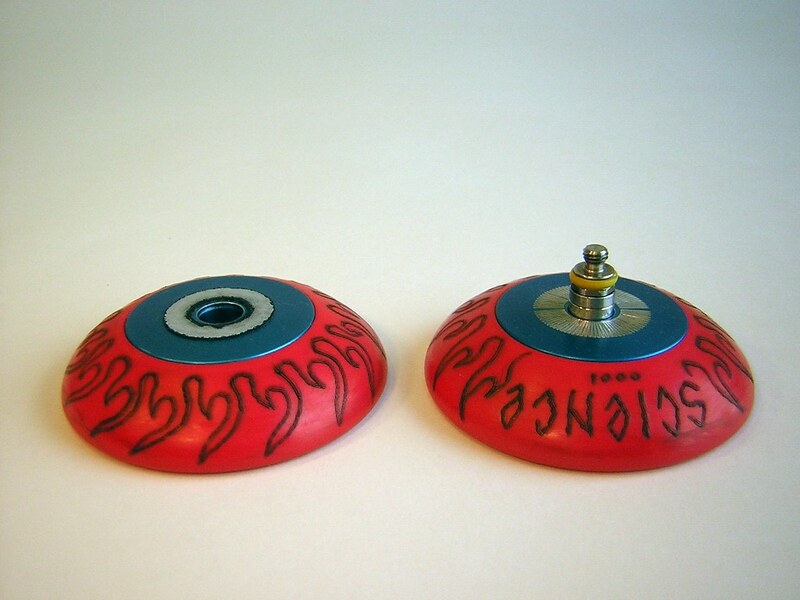 I used modded Vipers when I placed third at the World Yo-Yo Contest in Florida, in fact this is one of those yo-yos. The stock Viper was great for offstring play, but suffered in traditional yoing by it’s small gap and lack of response (when single looped). Shims could be used to widen the gap a little, but the classic Viper was equipped with a very narrow bearing. So you could only shim it out so far before the side of the bearing was exposed. Henrys used an unusual bearing size that made it impossible to find wider bearings that fit, so to fix the gap problem I would take to Viper bearings and place them side by side on the axle. This technique, which I called the Beefcake Mod, gave the Viper a huge gap, but it also seemed to have a secondary benefit. Yo-Yo string would often rest on the groove between the two bearings, thus keeping it centered and away from the sides. 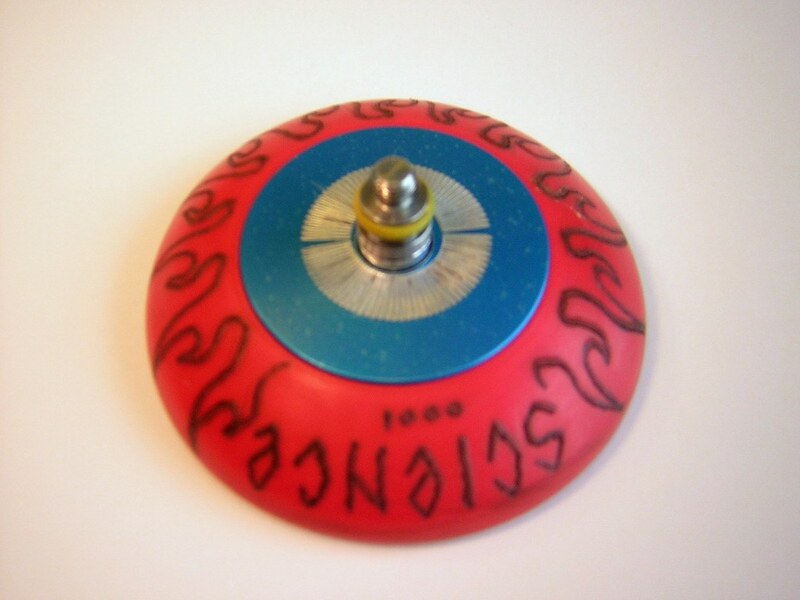 This concave technique was also used by Black Mamba’s auto return yo-yo and would later be developed by Frank Difeo to use in his Dif-e-yo bearings. The Viper came with the string double looped around the axle and relied on the yo-yos tapered narrow gap for response. Now that the gap was wider, a new response system would be needed. 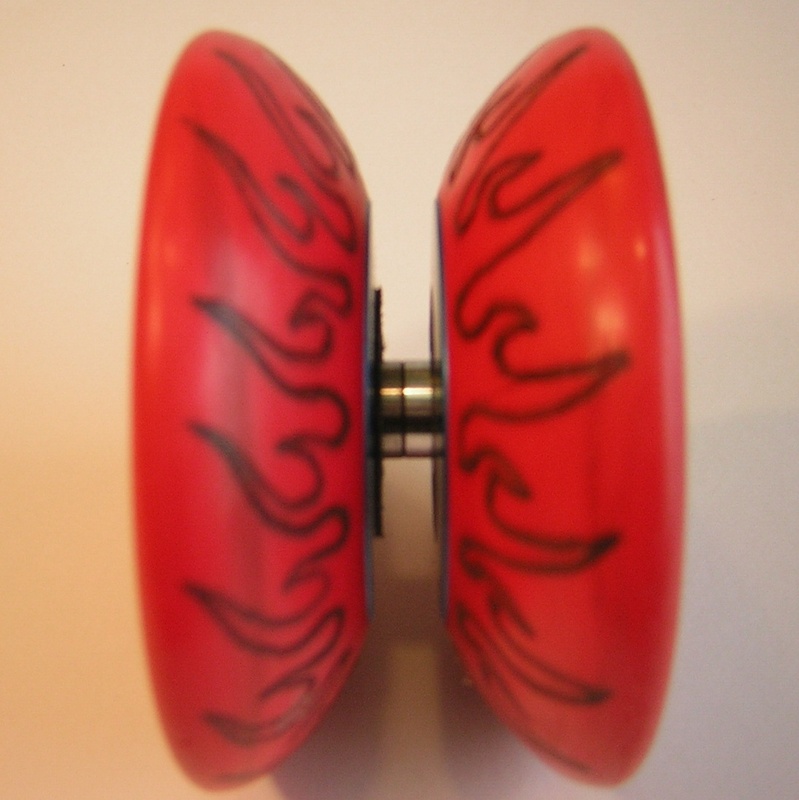 This was most easily done of by simply adding a Duncan friction sticker, but other methods where sometimes used as well including added super-glued “starbursts” or engraving. This Viper has a sticker on one side and has been engraved on the other side to create a negative starburst. The engraving was done at a Things Remembered store in the Mall of America. They charge by the word so I asked them to engrave “010101010101010101010101010101010101010101010101” in a concentric circle around the hub. In a final touch of beauty, the shells where taken in to a friends tattoo parlor. Using older needles he etched away at the shells with his tattoo gun. He did a few shells for me and I had him make some for Steve Brown and Jen Niles as well. Once tattooed, the shells are very textured. In fact you could probably read the writing by just feeling it with your eyes closed. My friend even numbered the tattooed shells “0001”, I guess he felt someday he may make it into the thousands. Later on, Henrys released the AXYS Viper which came with a much wider bearing, making it much easier to mod. ps- Happy National Yo-Yo Day! beefcake… BEEFCAKE! actually, this is one of my favorite mods ever. I was completely blown away by the Beefcake Bee i saw… it was luv ever since. The beefcake mod was used several times. It was a wonderful modification to the A-Line Cherry Bomb from Team Losi, and it was used for that in a worlds SE yo-yo back in the day. Infinite Illusions once modified the early viper for a special promotion by milling the face of the inside flat, and putting in SPR kits and a new threaded rod. It was quite good. and then of course there was the Great White, Spintastic’s beefcaked Tiger Shark. Doc the shells are awesome with the Tatoo work done on them.I wish I had them on my KC Jewell Viper hubs.I am so stoked on reading the 28 days of yo.I am learning quite a bit about the yoyo’s of not so far past. Aha… so that’s where the beefcake madness started! 😉 That does make a lot of sense for the Viper.